Dedigama V. Rodrigo is just a name, that we used to see in the second page of most Russian books (translated to Sinhala) found in Sri Lanka. I called him “just a name” due to reasons. 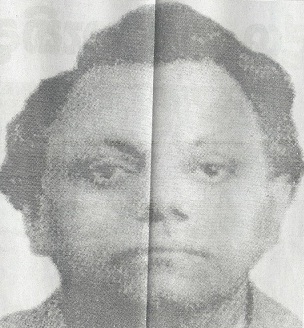 We have at least seen photographs of other translators and have managed to collect some information about them, but not about Dedigama Rodrigo. Dedigama Vincent Rodrigo himself seems to be an untold story. Sri Lankan readers have been influenced by Russian literature than any other stream of literature. Specially, when we were young and youthful, we were amazed and addicted to the true beauty, romance, power and progressiveness of the contexts of books by Aithmathaw, Gorky, Austhrovski and etc. They really touch our hearts and they were helping us to identify new emotions in us. Russian books translated to Sinhala by Dedigama was like a comprehensive example for the influence, books can made to a community. One day, when we were having some tea at Colombo public library canteen, while chatting about Russian literature, we decided to find out some information and probably to meet this legendary person. Our attempt was not successful since the first clue we could collect was about his death. Very recently (in 2010), I could read a little bit about Dedegama’s life from an article published in Divaina Paper. Though, I knew he was a communist party member who lived in Russia, just with the objective of getting Russian literature to Sinhala, I didn’t know he was initially a doctor who left the profession for his noble task. Though it is controversial, I too agree with the idea that Sri Lankan society was well-fed with ideology of a fair society through literature that lead to a revolution in 1971. It was a society without many developed audio/visual communication and information media we enjoy today. Luckily, Sri Lankan society was maintained with high rate of literacy than most other developing countries; in fact, it was a good background for development of literature. One should do an in-depth study on the reasons that Russian literature reached each and every layer of the society than English literature, considering the fact that we were under the administration of Queen for a long. We have adapted to most Victorian traditions, but not English literiture. In other terms, I wonder why “Tale of Two cities” didn’t reach all the layers of the society, but “The Mother” of Gorky and “The first Teacher “of Aithmathaw. One reason should be the context which is friendly for our agriculture based society. Other reason could be the clever translators like Dedigama. The First Teacher (Guru Geethaya) was one simple example for a Russian book, which captured the hearts of young readers in Sri Lanka. It is a masterpiece for me and most of my friends who like literature. Once I visited my brother at Peradeniya University. My brother was one big fan of Guru Geethaya. There was an amazing view of Hanthane Mountains from my brother’s hostel room. From there we could see two significant trees, which they used to call “Poplar” trees, which was a well explain symbol in the book. 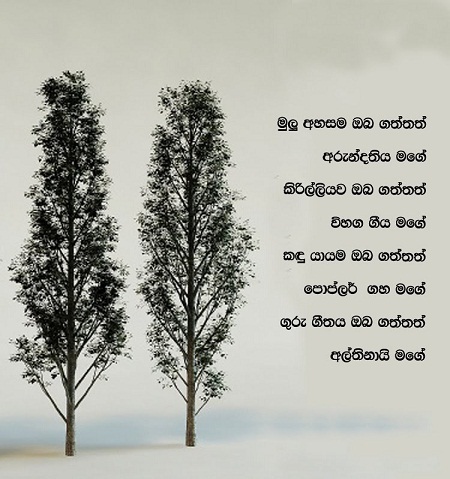 Sri Lanka hasn’t got Poplar trees, but they live in the hearts of the youth! Below poem is one of the nice once that shows poets passion on this book and its characters, which I saw in a Blog recently. It’s not an exaggeration, if I say, we lived with Russian literature than one can imagine today. Some characters became our heroes. We tried to grab some characteristics of them. We loved the way they think.. We wanted to be brave as them.. We wanted to have the commitment of Duishane in us.. We tried to find Althenai within the girls we liked.. I was wondering whether Steps plains is far different from Horton plains.. Anyway, this is becoming the history since, reading is very much lacking in the agenda’s of the generations followed afterwards. Literature was also removed from school curriculums since J.R Jayawardena though it’s nonsense. As he wanted, new generations didn’t have “fantastic” heroes we had, but “real” heroes like cricketers and Super stars! I recently met a Russian lady and had the chance of asking some questions about their literature. Surprisingly, she hadn’t read some of the Russian books I have read in Sinhala. So I had to explain how Russian literature influenced us and the mysterious person behind it.